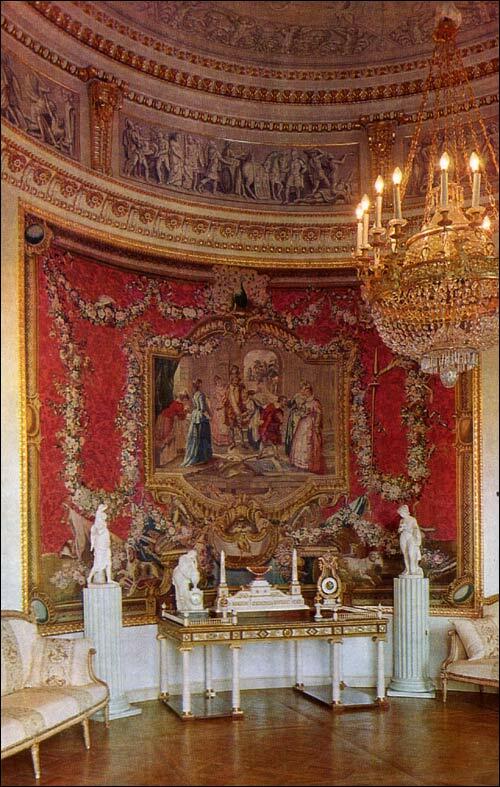 The Tapestry Room takes its name from its main decorative feature, the Gobelins tapestries presented to the Grand Duke Paul and his wife by Louis XVI. In order to bring out the full beauty of the largest of these, a rounded wall was built facing the windows; and directly opposite, between them, was installed a purely decorative fireplace with a large over-mantel mirror in which the tapestry is reflected. This device serves to heighten the impression of the tapestry, and to alter the apparent shape of the room, making it seem oval, and adding to the balance of its composition. The interior decoration of the Tapestry Room as it is at present reproduces the design of Voronikhin, realized in 1803-4. The painted ceiling, and the wide frieze consisting of panels in grisaille, painted with mythological subjects, each scene divided from the other by a moulded gilt console, were done in 1804 by Giovanni Scotti. The tapestry in the centre of the wall depicts Don Quixote Served by the Ladies. It was woven in 1776 by Pierre-Francois Cozette at the Gobelins Tapestry Works in Paris. The cartoons for the Don Quixote series of twenty-seven tapestries were designed by Charles-Antoine Coypel. Several sets were made, with backgrounds of different colours: crimson and rose, orange and the col. our of straw. Louis XVI's gift to Paul I, in 1782, consisted of four tapestries of the crimson and rose variety, particularly prized and now extremely rare. The side walls are decorated with eighteenth-century Brussels tapestries also depicting episodes from Cervantes's Don Quixote, which was enjoying great popularity at the time: Don Quixote being knighted, and his encounter with a flock of sheep. The set of carved and gilt furniture, with upholstery in exquisite Lyons needlework, was made in 1784 at the workshop of Henri Jacob, in Paris. 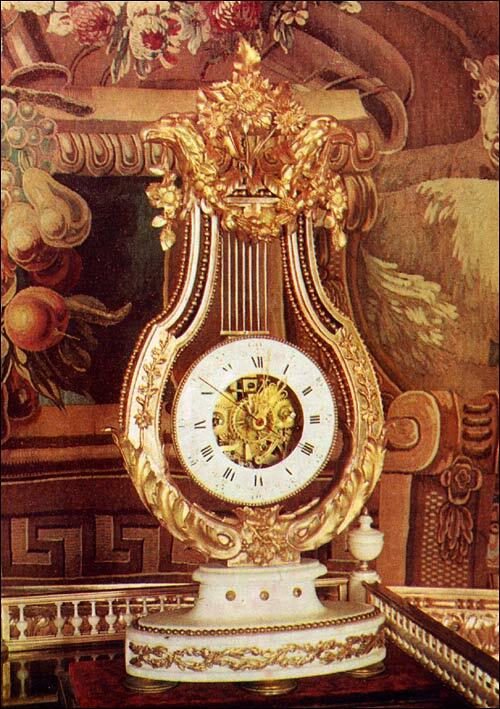 Furniture of this type was originally installed in all of the state apartments and private rooms of the Pavlovsk Palace. Other decorative objects in the Tapestry Room include sculptures, porcelain vases, works in carved ivory and amber, and several rare clocks.